Offshore, UK — ZephIR Lidar is pleased to announce that it has installed a turbine-mounted ZephIR DM wind lidar on the 270 MW Lincs Offshore Wind Farm. Located five miles off the Skegness coast, Lincs Wind Farm is a joint venture between Centrica Energy, Siemens Project Ventures and DONG Energy. It is anticipated that the installation of the lidar unit will help to identify opportunities where a possible improvement to production from the installed 75 Siemens 3.6 MW wind turbine generators can be achieved. 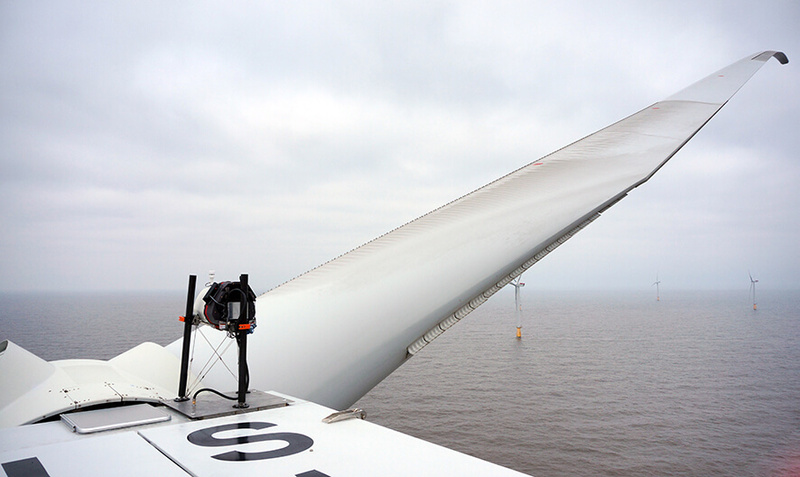 ZephIR Dual Mode (DM) is a continuous wave wind lidar, installed on the nacelle of a turbine and uniquely provides rotor equivalent wind measurements out in advance of a wind turbine from just 10 metres, well within the blade induction zone, and as far as 300 metres. The circular scan from ZephIR DM provides a representative wind picture that the turbine sees, in contrast to more basic systems that provide only a pillar-box view on the approaching wind. Measurements are then typically used for the correction of yaw misalignment, turbine calibrations, End of Warranty inspections, power curve measurements (absolute and relative), R&D projects and full turbine control. Lincs Offshore Wind Farm was officially opened by the Deputy Prime Minister Nick Clegg on 1 August 2013. Construction started in 2010 with first power achieved in August 2012 and the last of the Siemens 3.6 MW turbines lifted into place on Sunday 31 March 2013. The Centrica O&M team will use ZephIR DM as a permanent tool for the wind farm, to monitor and safeguard individual turbine performance and overall energy production. © 2014 Zephir Ltd. All rights reserved. ZephIR, Zephir, ZephIR 300, ZephIR DM and Waltz are trademarks of ZephIR Lidar. Other company and product names may be trademarks of their respective owners.